It’s often said that an ounce of prevention is worth more than a pound of cure. Well, when it comes to plumbing, a few dollars in prevention is worth more than thousands of dollars of repair and clean up costs in the aftermath of a malfunction. There are a few preventative measures you can put in place to keep your residential or commercial plumbing doing what it should – taking the things you don’t want pooling in your basement away from your home and disposing of them appropriately. Hydro flushing is an excellent preventive measure. All sewer and waste pipes, over time, collect debris in the nooks and crannies – often it’s a buildup of silty sludge, which can trap other material. Once enough material gets trapped in a pipe to slow the flow of effluent, the problem will be compounded as the existing waste material gets compacted and more and more solids bunch together. The result is an eventual stoppage of the pipe, a backup, and a potentially unpleasant and expensive flood. Regular maintenance of your sewer pipes through hydro flushing (in which the buildup in your pipes is blasted away by a high-pressure water jet) is the most cost-effective and safe way to prevent these blockages from forming. At Edenflo, we provide the lower mainland’s most expert pump truck services. We provide emergency response and preventive maintenance services to both residential and commercial customers. If you’ve got a sewer pipe to take care of, call us and we’ll help you keep things flowing. This entry was posted in Hydro Excavation and Flushing and tagged hydro flushing burnaby, hydro flushing preventive maintenance, hydro flushing surrey, hydrojetting aldergrove, hydrojetting delta, hydrojetting vancouver, sewer line flushing on January 28, 2016 by Edenflo. Whether they’re property managers or residential homeowners, most people deal with needing to excavate at some time or another. Fortunately, there are a number of new methods available that can make the process much easier. Let’s take a look at one of these, hydro excavation. 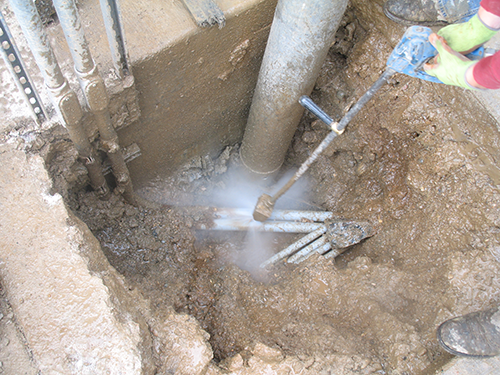 Hydro excavating is a process that combines pressurized water with an industrial strength vacuum. When used in tandem, hydro excavation services can both excavate soil and then evacuate it, as well. The process is beneficial for all kinds of excavating. For example, it can be used for potholing, slot trenching, removing miscellaneous debris, cold weather digging, piling hole excavation, and much more. One especially useful application is with exposing underground utilities. 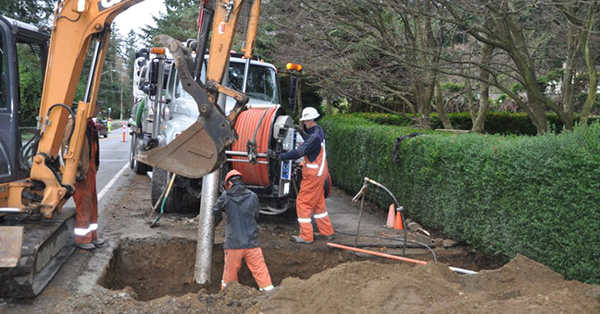 In fact, there’s no better way to find those buried utilities than with hydro excavation. The problem with conventional methods of excavating is that they can cause major problems if someone’s digging were to run into a buried septic system. This isn’t a concern when hydro excavating is being done. The process is often known as “soft digging” because the water is so non-destructive to whatever it touches. As such, if it does run into underground tanks, they’re left unharmed, and a much larger problem is avoided. 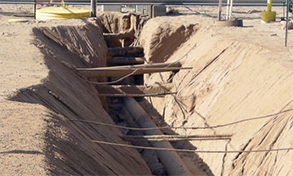 Opting to use hydro excavation carries a number of other benefits with it, as well. 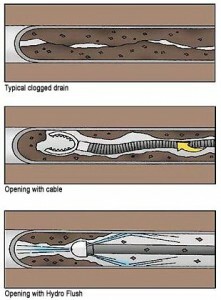 Hydro excavating is extremely cost-effective, for example. This is partially due to the fact that there is not nearly as great a need for ground repairs when the process is finished, as compared to conventional methods. That’s actually a good example of how hydro excavation can save money. Another is because it’s so much quicker, as well. When hydro excavation is used for problems near or below highways, for example, traffic isn’t impeded for nearly as long when compared to conventional methods. 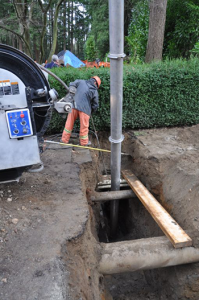 There are a number of reasons to choose hydro excavating for your excavation needs. Edenflo can not only help you better understand these instances, but they’ll also provide you with the services as well. This entry was posted in Hydro Excavation and Flushing and tagged benefits of hydro excavation, Hydro excavation, hydro excavation aldergrove, hydro excavation delta, hydro excavation Richmond, hydro excavation surrey, Hydro excavation vancouver, hydro excavation white rock, what is hydro excavation on February 9, 2014 by Edenflo. Slow Drainage? Don’t Replace the System! Hydro Flushing Gets Results! If your system is suffering from slow drainage, it can be easy to think about giving up and calling it quits. Even with all the trouble that it would involve, a new system would at least solve the problem. Fortunately, this isn’t necessary. Continue reading to discover a much easier solution to this nagging problem. When it comes to your septic tank, there are a number of things that could be causing slow drainage. Debris, silt, and sludge can all be the cause, by themselves or in combination, but the result is the same: a frustratingly slow drain that could actually be the symptom of a much larger problem on the horizon. Fortunately, this doesn’t mean your septic system needs to be replaced. In reality, what it most likely needs is to be treated with a process known as hydro flushing. The process is fairly self-explanatory. It’s a high-pressured way of flushing your drain. Basically, a hose is lowered down the drain with a specially made head at the bottom. This hose head directs the water out in all directions, similar to how sprinkler heads work in commercial buildings. By supplying the water at extremely high speeds, the drains are cleaned of all the silt, debris, and sludge caked on their walls. Another, similar, process known as line jetting can also be used. Line jetting simply uses a hose that is 3” or smaller, whereas hydro flushing uses lines 4” or larger. 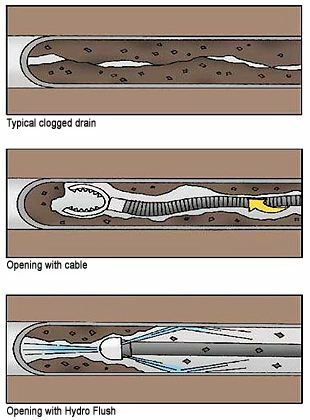 If your drains aren’t emptying like normal, you may have begun thinking your only option was to replace the system. Before you do, however, give Edenflo a call today. Their experts will be able to come take a look at your system and see if a simple dose of hydro flushing can do the trick instead. This entry was posted in Hydro Excavation and Flushing and tagged hydro flushing aldergrove, Hydro Flushing BC, hydro flushing burnaby, hydro flushing delta, hydro flushing surrey, hydro flushing vancouver, hydro flushing white rock, hydro vac services, What is hydro vac flushing on January 16, 2014 by Edenflo.